The Republicans got some bad news after the Congressional Budget Office (CBO) announced that the Senate health care plan they were proposing would result in 22 million Americans getting kicked off insurance rolls. Turns out, that’s a bitter pill to force your constituents to swallow, and so support seems to be flagging, forcing Senate Republican leaders to delay the vote until after the July 4 recess. Mitch McConnell originally said he hoped the vote could come before the recess. 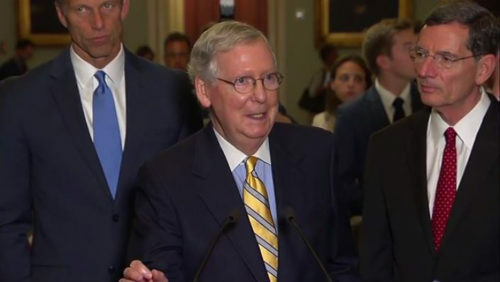 McConnell announced the move today to reports, saying it was “a complicated subject” that would take time on which to reach a consensus, and get the needed votes. “We’re going to continue the discussions within our conference on the differences that we have, that we’re going to continue to try to litigate. Consequently, we will not be on the bill this week, but we’re still working toward getting 50 people in a comfortable place,” he said. Meanwhile, President Donald Trump has invited all Republican Senators to the White House this afternoon. The plan would make devastating cuts to Medicaid, putting the lives of many at risk, including those living with HIV/AIDS. 40 percent of those living with HIV/AIDS are on Medicaid. Mara Keisling, executive director of the National Center for Transgender Equality, on the same call noted that transgender individuals would be hit hard by this bill as well. “Our organization has conducted the largest survey of transgender people, the United States Trans Survey…(and) in it we saw very clearly how transgender people are already marginalized in health care,” Keisling said. “33 percent of the transgender people in our sample said they did not seek health care in the last year when they needed it because they couldn’t afford it,” Keisling said, noting there is reason for the trans community, then, to be concerned about the cuts to Medicaid. Also of concern is the proposed defunding of Planned Parenthood.